1 of 5 In a small bowl, combine chili powder, onion powder, oregano, garlic powder and pepper. Stir to blend. Add oil and stir until combined. Rub into both sides of flank steak and transfer to a resealable plastic bag. Refrigerate until ready to grillup to 2 days. 2 of 5 Heat gas grill to medium-high or charcoal grill to medium-hot coals. Core peppers and grill 10 minutes, turning, or until slightly charred. Remove to a cutting board. 3 of 5 Season both sides of steak with salt and then grill steak 8 to 10 minutes (depending on thickness), turning once. 4 of 5 Meanwhile, slice peppers into thin strips and transfer to a bowl. Toss with salsa and cover to keep warm. 5 of 5 Once steak is finished, allow to rest for 5 minutes (keep warm). Thinly slice steak across the grain. 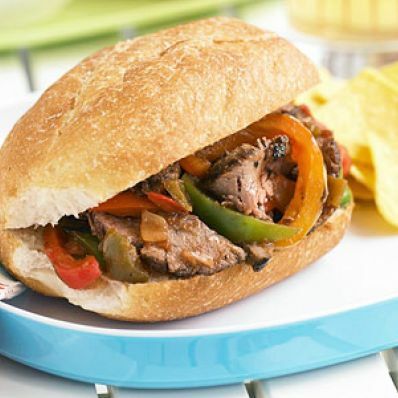 Toss steak and any accumulated juices with the pepper-salsa mixture. Spoon about 2/3 to 1 cup mixture onto each roll and serve warm.